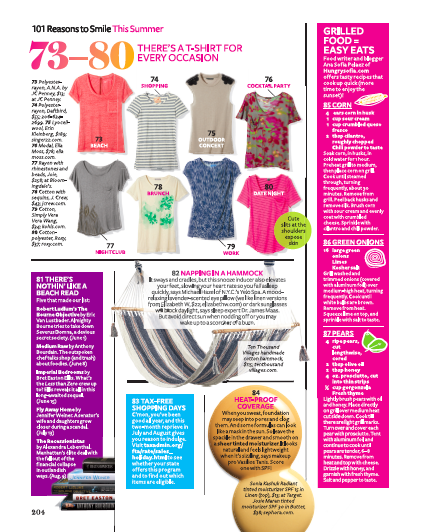 A few weeks ago, I was very excited to give Michelle Hainer for InStyle, #85-87 of “101 Reasons to Smile This Season” for their July issue, which just hit stands. Used to being the lone voice on my blog, it was a thrill to see my recipes for grilled corn with chili, green onions with lime, and pears topped with prosciutto and Gorgonzola, tucked into the pages with sky high wedges, gingham tops and the new Javier Bardem movie. You can never have to many reasons to smile so I hope you’ll pick up a copy and also take advantage of the other 98. ANA YOU HVE TO MAKE THE CORN FOE ME! It sounds delicious. How fun! Corn on it’s own makes me smile so I can only imagine what corn with all those yummy flavors will make me do.